Welcome to Pony Parties and Friends. All events and correspondence regarding events and visits to the farm are done by email. This is the best way to make sure that all parties have all information regarding thier event and so that we can best accomodate your needs. Once we have recieved your emailed request for a visit prior to your booking we will email you dates and times we are available. If you do not email your request we are unable to make these arrangments . We are fully insured listing the State of Alaska as well as the Matsu Borough and Anchorage Municipality as additionally insured. Additional insurance for your company can be purchased up to 30 days prior to your event. Please specify with us your desire to do this when making your booking. Mobile Horse rides are 2 hours, Mobile Petting Zoo is 3 hours, Horse Rides and Petting Combined are 3 hours. Unfortunately we are not able to offer discounts for events that are below our minumums. The cost of vetcare, feed, insurance, houseing, fuel etc is the same for us regardless of whether we are at your event for 2 hours or 3 hours. Our minumum requirements have been established to cover our basic needs to ensure we have healthy, happy animals to bring to your events year after year. Please use the navigation to the left and select parties for more information about our party options. Party Ponies and Friends is operated by the Taylor Family and also a board of directors that help make operating, and financial decisions so that the Taylors can continue to offer non-profit based pricing, and still provide shelter, feed and medical care for a vast variety of farm animals for all to enjoy. The Taylors have dedicated a significant part of thier lives to offering educational opportunities to students and adults alike in a variety of animal care, sciences and farm experiences. The Learning Farm in Palmer is Alaska's only Farm Life Education Program taught by certified teachers. This program is used and recognised by a vast array of homeschool families and can be paid for thru your allotment. Our Mobile Education program is used throughout the Mat Su Valley School District, Anchorage School District and with a variety of Summer Camp Programs including CampFire USA and TrailSide Discovery Camp. Throughout the last 13 years we have found that there is a need for community involvement exposure and education about livestock, agriculture and Ranching. As so many American farms continue to disappear and the ever growing destruction of farmland in Alaska continues, we have found that education about where your food comes from is vital. We also offer horse rides, pony rides, cart rides, sleigh rides, live nativity scenes,a petting zoo, and a variety of pony parties for just about any event. We are Christ centered and also see the need to support community programs and charities that provide life experiences to the elderly, disabled and children with special needs. As such Party Ponies and Friends currently donates $9,000 in services each year in discounted and free events to programs throught the Anchorage and Matsu Communities. One of the many reasons we are exploring becoming a 501 3c nonprofit. Currently we do not recieve any federal or state funding. Each community event that we support is directly supported by our own income. All of the land used by Party Ponies and Friends is Private Property whether leased by Party Ponies and Friends or owned by Party Ponies and Friends. Please be respectful and don't just go into these fields just because you recognize it from one of our photos. Every Field used by Party Ponies and Friends including the home on each farm is now monitored by 24 hr video surveillance. Trespassing is a violation of the law. Party Ponies and Friends may choose to prosecute anyone who violates this law. 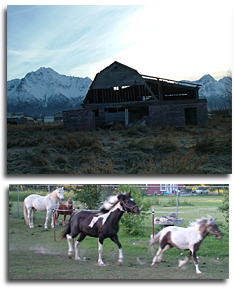 Our main purpose is to entertain folks with our gentle horses and their barnyard friends. We offer a variety of options to suit most any request. Since every situation is unique, we do our best to personalize our efforts to provide a safe, exciting, and memorable experience for all participants. We have been blessed with the opportunity to meet so many new and wonderful people. Our passion and love here at Party Ponies and Friends is to place ourselves into the community where we are needed most, assisted living centers, churches, elderly homes, educational programs, special needs programs, summer camps and more. Party Ponies and Friends can accommodate almost any event wedding receptions, company picnics, childrens' birthday parties, fund raisers. You name it we can probably do it. 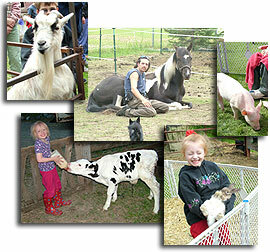 Come meet all our mini friends, mini pigs, potbelly piglets, ponies, goats, sheep, ducks, bunnies, chickens. If you can find it on a farm you can find it with Party Ponies. We offer fun for all ages! Search other pony rides & petting zoos on Festivals-and-Shows.com!